Our ever popular Jack the Joker fundraiser continues this Sunday night in Alice O’Connors where the jackpot is €8,200 as on Sunday night Ben O’Donovan was drawn out of the drum and chose card number 14, which when turned was not the Joker though he did win €50. Stephen Enright and James, Jack and Joey won €25 each. As well as our group of ticket sellers tickets can be purchased from Convenience Store Ballinroad, Village Flowers, Spar, Mousies Takeaway, Minnies Bar, Abbeyside Post Office and Crottys Corner Bar. On Friday night last we played Tallow in our third game of the County Championship in Fraher Field, with our opponents hitting 1-01 in injury time to take the spoils by a point. We now have two games remaining in the Championship against Mt. Sion and Fourmilewater. TEAM: S. ENRIGHT, M. POWER, B. LOOBY, S. O’DONOVAN, J. O’MAHONY, C. PRUNTY, J. HURNEY, R. FOLEY, D. COLLINS, D. McGRATH, M. O’HALLORAN, N. MONTGOMERY, S. DALY, P. HURNEY, M. FERNCOMBE. Our Junior hurlers took on Geraldines in their final game of the group stages of the Western Championship on Saturday afternoon last. At the end of a high scoring game it was the Aglish men who came out winners, meaning we come second in the group and now play Dungarvan in the Western Quarter Final. TEAM: S. RYAN, M. COLEMAN, G. BREEN, S. O’CONNOR, D. HENLEY, J. ELSTED, D. FERNCOMBE, D. HICKEY, D. SWEENEY, R. RYAN, L. HURNEY, R. CONWAY, E. KIELY, E. ENRIGHT, T. MURRAY. A mobile phone was found at the club grounds over the weekend and if you believe it may be yours then please contact Bernard Shields. Our club bingo will continue this Sunday night, with a return to the CBS Hall where the jackpot is €450. Our U12s had a very busy schedule last week. 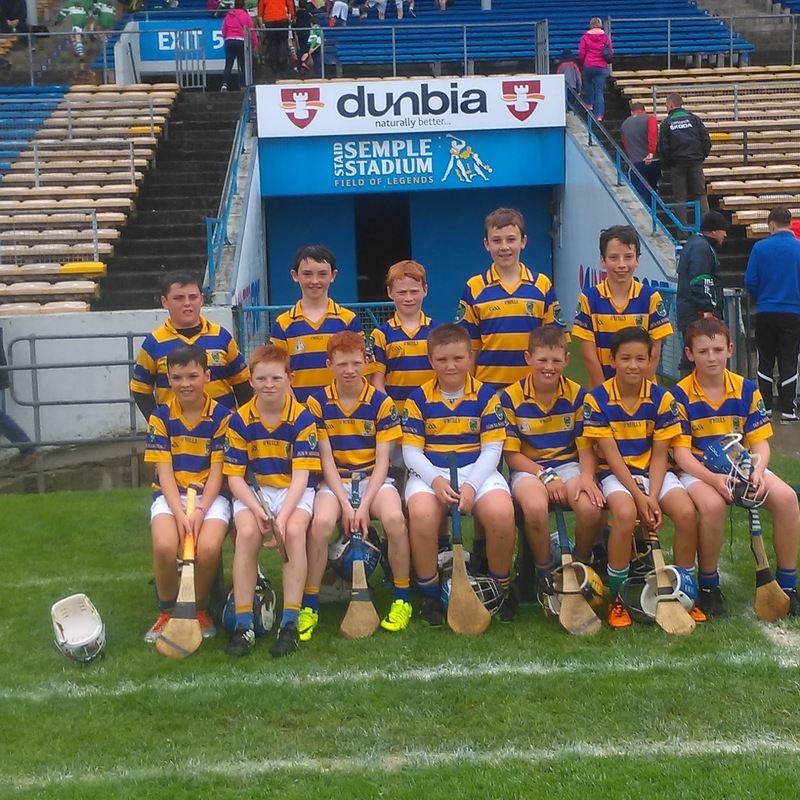 Firstly we headed to Thurles to take part in the Munster hurling activity day. We had 3 short games which we were pitted against Aghabullogue, Killeagh and Kilruane McDonaghs and thankfully we won our 3 games and then we had a stadium tour with Michael Breen the Tipperary senior hurling star. 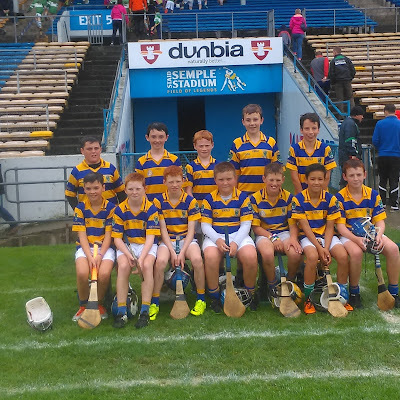 We had a great time in Semple Stadium and it was a great opportunity for our young players to grace the historic venue. 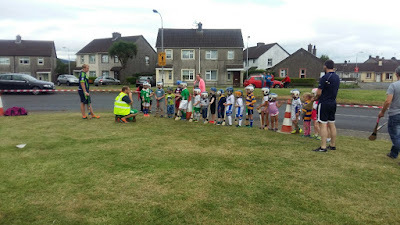 Next on our schedule was we had Town and Country Football League in which we entertained St. Patricks and it was nip and tuck the whole way. We won by a couple of points at the end. Our final outing was back to hurling again and this time we travelled to Erins Own in Cork to take part in Colman Dillion Tournament in which we were pitted against 3 very strong teams. We played Midleton in our first game and this was a very tough game and won it with a very fine performance in the second half. Next up was Kilmacud Crokes. This also was a very tough game and unfortunately we lost this game narrowly in the end. In our last game we needed to win against Valley Rovers and unfortunately we came up against a very strong team and lost this one. Our academy training sessions will continue this Saturday morning for players between under 6 and under 9 at the club grounds between 10.30 and 11.30. We travel to the Mill Field on Friday evening next to take on the Nire in the latest round of the Town and Country League Football. A report of this game will be included in next week’s notes. The Under 9s welcomed Lismore and St Patricks to the Burgery last Saturday morning for a hurling blitz. Some great games were played with the four teams at a similar level. We would like to thank Lismore and St Pats for attending. A huge thank you to the parents who brought buns cakes etc for the blitz and who helped out to make sure adults and kids alike were well looked after. This is greatly appreciated. Finally we would like to thank our own boys who continue to come along to the field for training or matches in big numbers and are really enjoying it. Our Under 16 hurling team play against De Le Salle tonight (Wednesday 31st) in Abbeyside in the latest round of the Under 16 Hurling Championship. Please come out to support the lads and best of luck to all concerned. Well done to our club players who represented their county in the Under 14 Tony Forristal and Sonny Walsh tournaments in Waterford last weekend as well as the players who represented Waterford in the Under 15, 16 and 17 tournaments last weekend also. We would also like to wish William Beresford from our Under 13 team the best of luck as he lines out in Croke Park on All Ireland Final Day as part of the Mini Sevens exhibition game. This is a wonderful achievement for William and we hope he has a day that he will never forget. Hopefully it will be the first time of many he lights up the pitch at headquarters. We were beaten in the latest round of the minor hurling championship against Portlaw/Ballyduff on a score line of 2-19 to 2-14. Next match here is against Dungarvan on September the 7th. It was a busy couple of days for the Under 11 age group. On Wednesday last we went to Lismore for a mini hurling blitz where we took on Lismore first. In an entertaining game we shared the spoils. Straight into our next match against Midleton and the boys built on the first game and won well at the end. On Friday night we went back to football for our latest Town & Country game when Gaultier visited the Burgery. After an even enough first half the eastern side proved too strong for our lads and won comfortably at the finish. Next up is the Nire in a couple of weeks. Football training continues Friday nights at 6pm till 7pm. The Under 14 hurling team continue to train every Tuesday and Thursday night at the club grounds. All in the juvenile club would also like to wish Colin Foley and Alex Norris the very best of luck as they represent the club and their county in the Tony Forristal and Sonny Walsh competitions in Waterford this weekend. This is a marvellous achievement for both players and hopefully they will have a weekend that they will never forget. It was also a busy week for our Under 10 team. On Monday night of last week they took on St Olivers and on Saturday last they took on Ballybacon Grange who were coached by ex Tipperary goalie Brendan Cummins. The lads really enjoyed both matches, and as I said earlier in the year in this page, are improving with every outing. They were also due to play Fourmilewater last night (Tuesday). At the time of going to print the result of this match was not available but will be included in next week’s notes. Our Under 13 hurling team had a very good win against Lismore in the last week and are now into a semi final of the western championship which will be played on September 3rd. Our minor hurling team played the latest round of their championship on Thursday night last against Lismore. On the evening that was ideal for hurling it was the Lismore team that upped their game in the second half to come out on top on a score line of 2-20 to 3-08. Next match here for the lads is against Portlaw/Ballyduff on the 22nd August. After a poor display in their last match against Roanmore our Under16 team came into their latest game in their championship needing a moral boosting win. On the night it was De Le Salle who provided the opposition. Our lads were much sharper and hungry than they were in previous games putting in their best display so far and thus coming away with victory on the night on a score line of 0-20 to 2-10. Well done to all involved. Our ever popular Jack the Joker fundraiser continues this Sunday night in Alice O’Connors where the jackpot is €7,800 as on Sunday night John Cosgrave was drawn out of the drum and chose card number 32, which when turned was not the Joker though he did win €50. Paula Dunford and Nuala Foley won €25 each. As well as our group of ticket sellers tickets can be purchased from Convenience Store Ballinroad, Village Flowers, Spar, Mousies Takeaway, Minnies Bar, Abbeyside Post Office and Crottys Corner Bar. Our Junior B hurlers recorded a very good win over Modeligo on Friday night last in Colligan and now have one game remaining in the championship versus Shamrocks. TEAM: J.P. McGRATH, A. O’RAGHNAIGH, D. BYRNE, S. O’GORMAN, D. FERNCOMBE, J. MULLEN, P. COLLINS, B. HENLEY, J. BERESFORD, J. ORGAN, M. MAHER, O. YOUNG, S. LANIGAN, J. O’RIORDAN, J. WALSH. SUBS: C. DWYER, T. COLLINS. On behalf of all in the club we would like to wish Conor Prunty and all the county under 21 hurlers the very best of luck ahead of their All Ireland Semi Final against Antrim this Saturday in Thurles. This Friday night we play Passage in the Sargent Cup semi final at 8:30 pm in Fraher Field. This Sunday we play Tourin at 1:30 in Bushy Park in our third game of the Western Championship. Our club bingo will continue this Sunday night, but it sees a change of venue to The Park Hotel with a jackpot of €400. On behalf of all in the club we would like to extend our sympathies to the family and friends of the Pat Veale, Strandside who passed away recently. Pat was principal of Scoil Mhuire for many years and his son Pat was a very talented player for the club. We would also like to extend our sympathy to the family and friends of the late Fr. Richard Doherty who passed away last week. Fr. Doherty was Parish Priest of Abbeyside for many years and was involved in many committees and organisations in the parish. Our ever popular Jack the Joker fundraiser continues this Sunday night in Alice O’Connors where the jackpot is €7,600 as on Monday night Bernard Troy was drawn out of the drum and chose card number 31, which when turned was not the Joker though he did win €50. Charlie Crotty and Rita Sawdust won €25 each. As well as our group of ticket sellers tickets can be purchased from Convenience Store Ballinroad, Village Flowers, Spar, Mousies Takeaway, Minnies Bar, Abbeyside Post Office and Crotty’s Corner Bar. Our Junior B hurlers play Modeligo on Friday night in Colligan at 7pm in their last game of the group stages of the Western Championship. Please note that due to the replay of the All Ireland Senior Hurling Semi Final our Senior Championship game against Tallow and our Junior game against Tourin have both been postponed. Our club bingo will continue this Sunday night, but it sees a change of venue to The Park Hotel with a jackpot of €2,150. 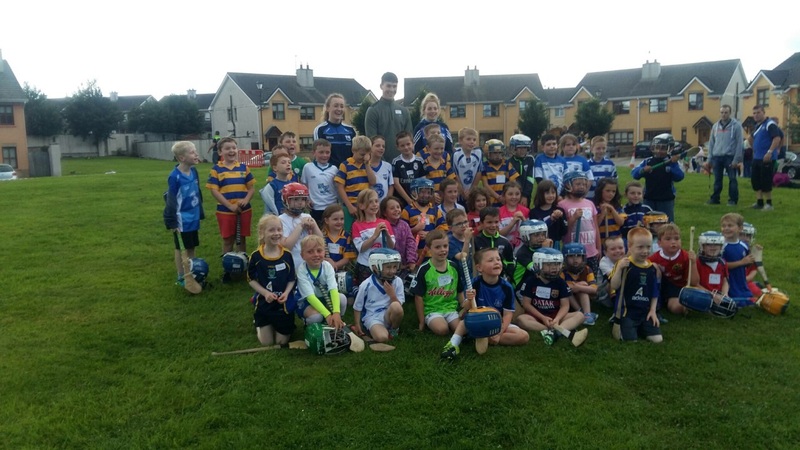 Our fourth HOTG session was held in Páirc na mBláth, Ballinroad on Wed Aug 3rd last and for the fourth successive week, we had another large turn-out. Guest coaches were Waterford Ladies footballers, Maria Delahunty and Caoimhe McGrath and County U-21 hurler Conor Prunty. Thanks to the residents for cutting the grass and supporting the event. Alot of people contribute to making “Hurling On The Green” a success and due to the fact that we have now completed our 2016 Programme it’s only fitting that we thank everyone who has helped us this year. Firstly, to all the residents in the four estates, who made us welcome and helped prepare the greens and promote the event, thank you. Thanks to all the parents for supporting each event and to all the children, who enjoyed themselves so much and made it all so worthwhile. To the Staff of Waterford County Council, who had the greens in Tournore, Cruchan and McCarthyville like a billiard table and who supplied us with cones and safety barriers over the four weeks, it was much appreciated. A large band of club members put in a lot of work to ensure the events run safely and smoothly. Much of the work is unseen; however, it’s very much appreciated. If you enjoyed HOTG and wish to play more Hurling, Football or Camogie, you are welcome to come along to our Academy sessions on Saturday morning from 10:30 to 11:30 & Camogie on Friday evenings from 6.30pm. We will be holding a special blitz for all our young camogie players, hurlers & footballers on Saturday 17th September, more news over the coming weeks. 2016 has been a fantastic success for Waterford GAA Cúl Camps with a huge increase in the numbers of children taking part. The camps have all been great and the feedback from parents has been wonderful, so we are looking to try and give something back and so we will hold two extra camps. Both will be the same week, 22th to 26th August and will take place in our County Grounds, Walsh Park and Fraher Field. We will have loads of unique prizes and lots of visits from County Players, including our Cúl Camp Ambassadors, Tadhg Bourke and Patrick Curran. Venues: Walsh Park and Fraher Field. Dates: 22th to 26th August, Monday to Friday 10 am to 2.30 pm. Please note no gear is available at these camps. Limited number of places at each venue. Booking: Use the 2016 Cúl Camps Booking form and return to Coaching Office, Walsh Pk, Keane’s Road, Waterford. The U11’s got their football campaign off to a winning start with a fine display against St. Pats in Kilgobnet on Friday night last (5th of August). Next up is Gaultier in Abbeyside. Our U14 hurling team played their final league game on Monday of last week away to Portlaw. Training continues every Tuesday and Thursday at the club grounds. Roanmore travelled to Abbeyside on Saturday to play our U15’s in the second round of the U15 Hurling League. Despite our boys not being as physically big and strong as the city side, they stuck with them for most of the game, but in the end were well beaten 7-7 to 3.4. Despite being beaten Abbeyside played with huge heart and commitment until the final whistle. Our U16 hurling team played Passage on Monday night of last week in Abbeyside and had a comprehensive win (6-14 to 0-09). The same team travelled to Roanmore two nights later and were well beaten by a much improved and better Roanmore side on a scoreline of 6-19 to 0-1. Our Minor Hurling Team are playing the next round of their county championship tonight (Wednesday) away to Ballygunner at 7pm. Support for the team would be appreciated. Our ever popular Jack the Joker fundraiser continues this Sunday night in Alice O’Connors where the jackpot is €7,400 as on Sunday night Richie Hayes was drawn out of the drum and chose card number 17, which when turned was not the Joker though he did win €50. Michael and Stephen Donovan and Anne McGrath won €25 each. As well as our group of ticket sellers tickets can be purchased from Convenience Store Ballinroad, Village Flowers, Spar, Mousies Takeaway, Minnies Bar, Abbeyside Post Office and Crotty’s Corner Bar. On behalf of all in the club we would like to congratulate Conor Prunty and all the County Under 21 hurlers on their Munster Final victory against Tipperary in Walsh Park on Wednesday last. On Saturday night last our senior footballers recorded their first win in the County Championship with a good win over Ardmore. Our next game is against The Nire in late August. TEAM: S. ENRIGHT, C. McCARTHY, B. LOOBY, E. BERGIN, D. COLLINS, S. BRIGGS, J. HURNEY, S. O’HARE, C. PRUNTY, G. HURNEY, M. FERNCOMBE, J. O’MAHONY, S. O’DONOVAN, P. HURNEY, M. O’HALLORAN. SUBS: M. MAHER, N. MONTGOMMERY, J. ELSTED, P. LYNCH, D. LOOBY. Our club bingo will continue this Sunday night, but it sees a change of venue to The Park Hotel with a jackpot of €2,100. On behalf of all in the club we would like to extend our sympathies to the O’Riordan family, Murphy Place on the death of Michael “Lylie”O’Riordan. Lylie’s sons played for the club for many years helping to win numerous county titles and his grandsons continue to play for the club today maintaining the proud family tradition. Booking: Use the 2016 Cúl Camps Booking form and return to Coaching Officer, Walsh Pk, Keane’s Road, Waterford. 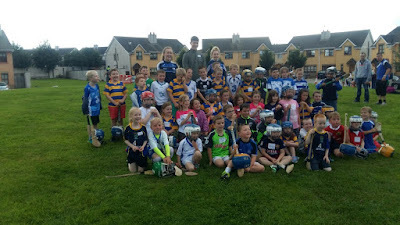 A big crowd turned out for our third HOTG session in McCarthy Ville on Wednesday evening last. Although we had one or two showers, the fun and enjoyment was not dampened in any way. Thanks to the residents and everyone who contributed to making the event such a success. This week we are heading to Páirc na mBláth in Ballinroad. This session covers Kilminion, An Grianán, Knocknagranagh, An Rosán, Cúl na Cille and surrounding areas. Registration commences at 6:30pm, with activities running from 7 to 8 pm. If you enjoyed HOTG, or and wish to play more Hurling, Football or Camogie, you are welcome to come along to our Academy sessions on Saturday morning from 10:30 to 11:30 and Camogie on Friday evenings from 6pm. New members are always welcome at our Academy sessions. 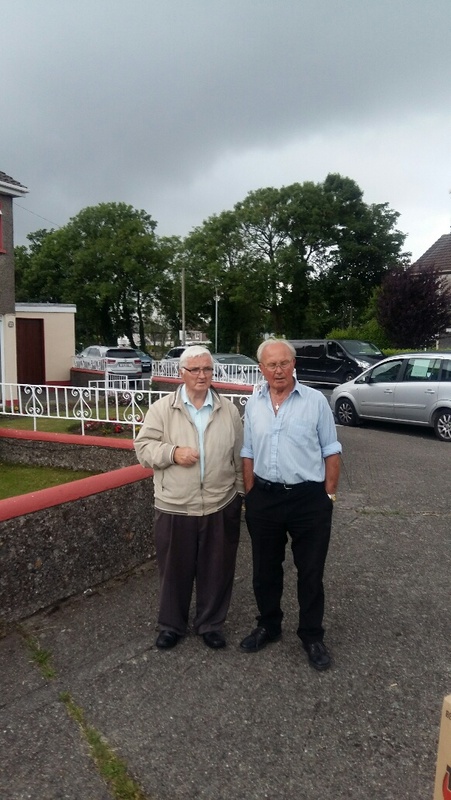 Pictured at the HOTG session in McCarthy Ville on Wed last was our ever busy club chairman Bernard Shields, who was taking a quick break from the HOTG activity to chat to long time resident & former team mate Eddie Moore. A native of Holycross in Co. Tipperary, Eddie wore the club colours for many years, with both himself & Bernard playing in the 1964 County Senior Hurling final against Mount Sion, in which the city side took the honours by 3-6 to 1-6. A year later, in 1965 both were involved in Ballinacourty’s historic first ever county Championship winning side, which captured the County Intermediate Football title & earned our place in senior ranks for the very first time. We play our first town and country league football match this Friday night coming the 5th August when we are away to St Pats. A report on this match will be included in next week’s notes. Under 14 hurling training continues on Tuesdays and the last round of the league will be played on Monday next. We wish all involved the very best of luck. In our second game in the County Minor Hurling Championship we took on Clonea. In what turned out to be a great free scoring game we came out on top on a score line of 3-16 to 3-12. This was a much improved performance on the first match against De Le Salle and that improvement will have to continue as our next match up is against a very strong Ballygunner team on Wednesday 10th August. Our under 16 hurling team were due to play two fixtures this week. The first was to have taken place on Monday night last and the second is due to be played tonight Wednesday (ask players or mentors for details). We will be trying hard to win these two games to give us the best chance of getting out of the group. On Saturday afternoon last we played our first game in the Under 15 County Hurling Championship against Mount Sion. Despite being under strength on the day due to commitments over the bank holiday weekend the lads battled away bravely throughout. On the day it was the city team that took the spoils on a score line of 5-7 to 2-8.